Cars are meant to go where you steer them – sometimes this is not the case. If your vehicle is veering to either side, it may be time for a wheel alignment at Bowe’s Exxon Car Care Center auto repair facility. Our technicians have years of experience in aligning automobile and light truck wheels to assure a smooth, safe, and straight ride to your destination. This is not a procedure easily done at home and should be handled by professionals using the proper tools and alignment equipment. 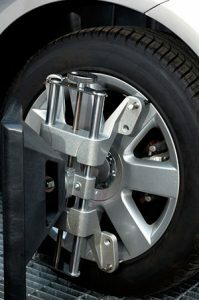 During a wheel alignment, mathematical computations detect the precise angles at which the wheels must be set in order to restore the car to an ideal condition for safe driving. Take a look at your tires – is there uneven wear? Does your car wobble ever so slightly during your daily commute? It’s time to visit Bowes. If you’re near Our location on Butler Pike In Conshohocken take advantage of our free local courtesy shuttle service. Drop your car off take the shuttle to work, home or wherever you need to be in the local area and we’ll pick you up when your alignment service has been completed.